This delicious yet simple dish is a Neapolitan classic that can be enjoyed at any time of the day or evening. This dish stands either on it's own or as an accompaniment to other dishes. Always source the best quality ingredients. 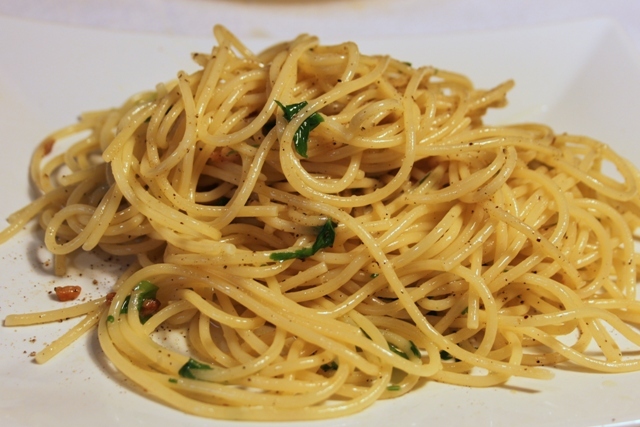 Cook the spaghetti in lots of boiling salted water until it is 'al dente' or slightly nutty in texture. Drain and set aside. Over medium heat fry the garlic in the butter and olive oil. Stir and fry, taking care not to let the garlic burn. When the garlic aroma hits you, it is time to add the cooked spaghetti. Stir to combine the ingredients and remove the pan from the heat. Add lots and lots of freshly ground black pepper, and add sea salt to taste. I love to serve this with grilled fish and a Caprese (tomato and mozzarella) salad. You can also use soba (buckwheat) noodles as a super-healthy alternative.